Cape Town's Motor Vehicle License Renewal Department at the Civic Centre. While Cape Town battles a severe water crisis, the city's motorists, at least, have reason to smile: Emerge Queue has taken the hassle out of queuing for licence renewals. In partnership with Britehouse, a division of Dimension Data, Emerge Queue installed the first of a series of new customer journey management systems in the pipeline for the City of Cape Town. 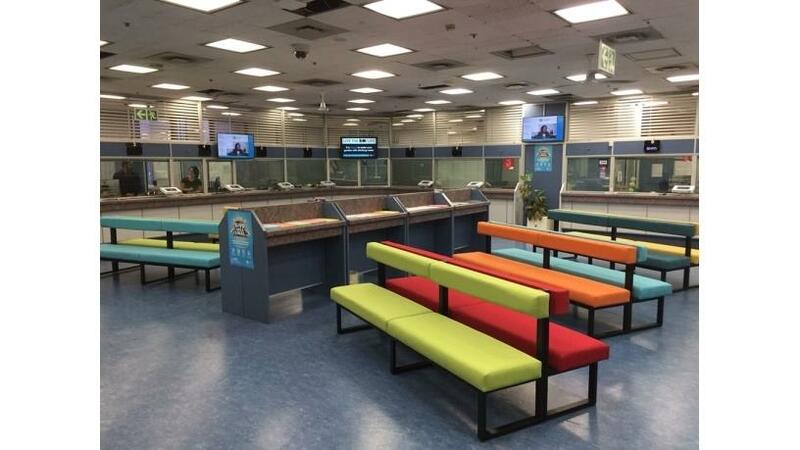 The system, Qmatic's Orchestra 6.2, was installed at the Motor Vehicle Licence Renewal Department at the Civic Centre, which is one of the city's busiest service points. The queuing system is set to significantly improve customer experience at the branch. When they arrive, customers select their service and receive a ticket from the Intro17 at the entrance. If the waiting time is longer than 20 minutes, customers can relax in a nearby coffee shop and will receive a notification SMS when it's almost their turn in the queue. An Intro17 issues tickets at the entrance. Each of the branch's 17 counters has been fitted with tablets and a Notes 924 White. Each of the 17 counters at the Civic Centre Motor Vehicle Licence Renewal Department has been fitted with a Notes 924 White, which displays the counter number and the ticket being called. Each counter is also equipped with two tablets: one of the tablets is used by the staff member to call customers and the other is used by customers to give feedback on the service. "Despite its water woes, Cape Town remains a world-class city. We're proud to have been selected as its customer journey management partner," says Eugene Swanepoel, Managing Director of Emerge Queue.